Choosing to buy a new home or sell your current home is a BIG decision. It is something that takes a lot of thought and consideration - and, for some, it can be intimidating to think about going through the whole time-consuming process alone. But, I’ve got some good news! It isn’t something you have to go through alone – real estate agents, just like me, are here to help you every step of the way! Why should I get a real estate agent? Why shouldn’t I just try and sell my home by myself? These questions often come up for many homebuyers and sellers. And, of course, you absolutely can sell your home and shop for your new home by yourself – but, should you? What benefits are there for you to use a real estate agent? 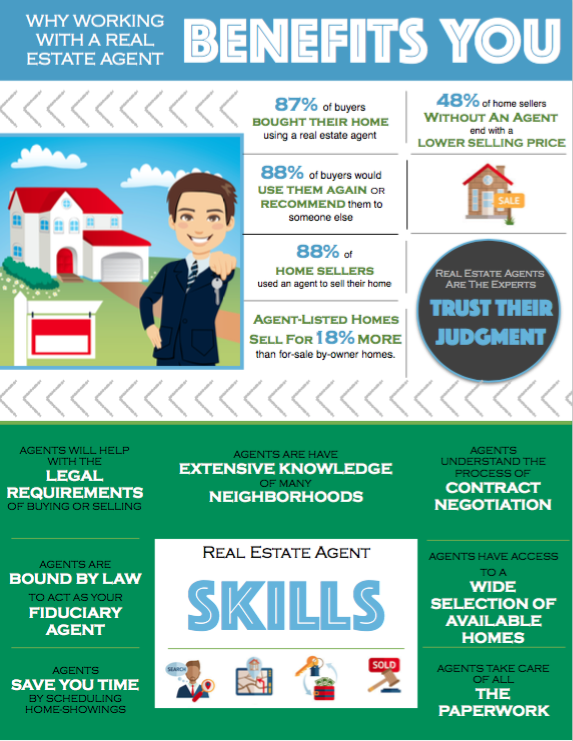 Take a look at the benefits YOU receive for using an experienced and reliable real estate agent! What do you think? Is using a real estate agent worth it? I think so! Do you know anyone in the market to buy or sell a home? Give me a call I would love to help!